Partly cloudy. High 77F. Winds S at 5 to 10 mph..
Will blue paint and vines win over Silver Lake wall critics? 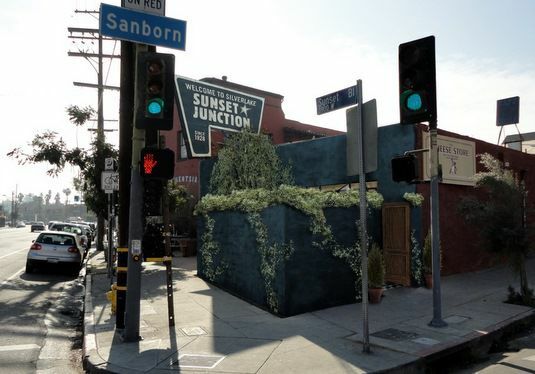 Silver Lake restaurant owner Gareth Kantner is scheduled to appear at a community meeting tonight to respond to criticism – and graffiti – that has been directed at a wall he is building in front of an expansion of his Cafe Stella at the corner of Sunset Boulevard and Sanborn. This morning, Cafe Stella emailed The Eastsider the rendering (pictured at top) of what the approximately six-foot-high, cinder block wall will look like after it has been completed and landscaped (click on the bottom link for the same wall painted a different color). Will blue paint, vines and wooden doors win over the wall critics? Stay tuned. 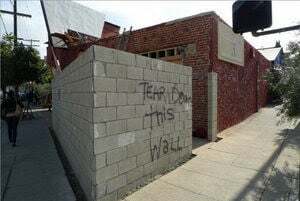 The wall will be discussed during the Silver Lake Neighborhood Council’s Governmental Affairs Committee meeting at 5:30 p.m. at Russian Orthodox Church Meeting Hall, 650 Micheltorena St.